Turkey continues to pursue a very political, twin-track approach to modernizing its ground-based long-range air defenses. At the end of December, it signed the anticipated contract to buy the S-400 system from Russia, despite pressure from NATO to abandon the deal. On January 5, as expected, it signed a project definition study contract with Eurosam for a future Long Range Air and Missile Defense System (LORAMIDS). 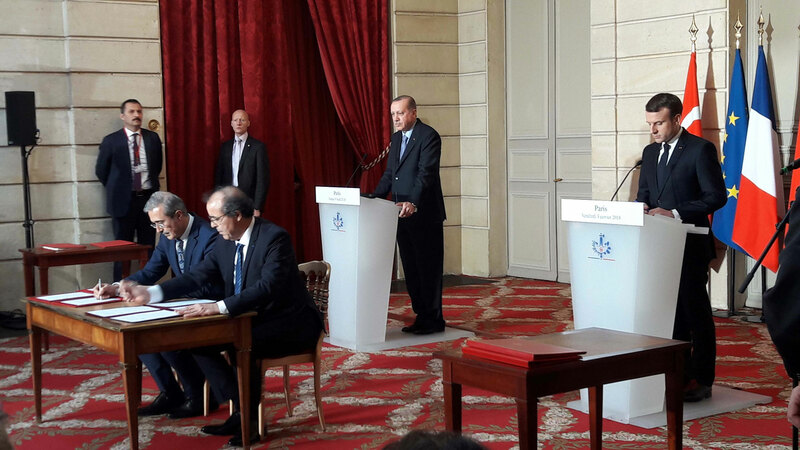 The signing was witnessed by President Macron of France and by President Erdogan of Turkey, during a visit by Erdogan to Paris. According to Eurosam, the 18-month study will lead to “a state-of-the-art military capability designed to counter the most challenging threats (stealth aircraft, UAVs, cruise missiles, and ballistic missiles).” Eurosam is the joint venture between MBDA (66 percent) and Thales (33 percent) that has produced the SAMP/T system that is now in service with the French and Italian armies. The two European countries have been considering a mid-life upgrade (MLU), to reach initial operating capability around 2024. A Eurosam spokesman told AIN that development for the MLU, of the new version of the MBDA Aster 30 SAM designated Block 1NT, is continuing. But other elements of the MLU, such as the radar, have not yet been defined, he noted. With Turkey now participating, that work will now be joined by Turkish companies Aselsan and Roketsan. “I am confident that this cooperation will also last several decades and will contribute to bringing our countries closer on a strategic level, as it has been the case for the last 30 years with France and Italy," said Eurosam managing director Abdoulaye Samba. Of note, Eurosam stated that the proposed system “will guarantee Turkey has full employment autonomy and will allow a sovereign choice of integration level within NATO. The joint development activity is expected to support Turkey’s indigenous air and missile development program.” According to Turkish defense commentator Turan Oğuz as quoted by Turkish newspaper The Daily Sabah, Aselsan and Roketsan have been working on low and medium-range air defense systems named Hisar since 2007. It now seems that Turkey regards the S-400 acquisition as an interim plan. The country’s Undersecretariat for Defence Industries (Turkish acronym SSM) said that it is buying only two batteries, with the first delivery in early 2020. In earlier negotiations, the two countries had reportedly discussed the supply of four batteries, with the second pair to be manufactured in Turkey.